Volunteering is a great way to contribute to your community. There are many ways you can get involved with scosa regardless of your background, expertise or experience. Volunteering is a fantastic way to meet new people, learn new skills, gain personal satisfaction and have fun. We are looking for both individual and corporate volunteers. Individuals generally have a greater capacity to lend support on a regular basis, whether it be weekly, fortnightly or monthly, while corporate volunteers tend to get involved with scosa on one or two occasions throughout the year. Major events – throughout the year we host various fundraising events including dinners, community activities such as our scosa Stampede community walk, Battle of the Brains Quiz Night and a host of other functions. Ways in which you can get involved include joining one of our event fundraising committees, lending a hand on the day/night of the event, or helping us to source auction and raffle items. It’s a lot of fun and also a great learning experience, especially for people interested in event management. Assisting with placement and collection of our scosa donation balls around Adelaide and regional South Australia. 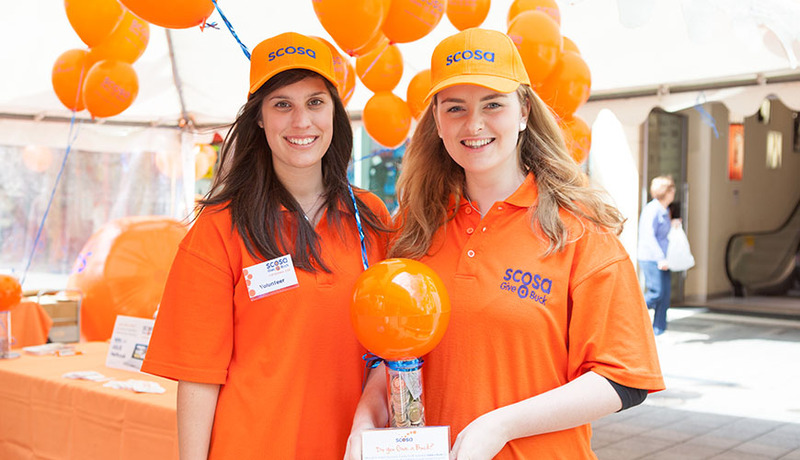 Currently we have around 600 of our bright orange scosa donation balls on the counters of a wide variety of shops, cafes, hotels, fish and chip shops and the like. We will team you up with someone with similar interests, provide you with a vehicle and petrol, and guide you to targeted areas where there is the opportunity to grow the number of collection balls out in the community. It’s a fabulous way to make some new friends and assist South Australians living with disabilities! Drivers – you may have noticed that we have quite a large fleet of scosa vans out on the road, taking our participants to a whole range of experiences such as shopping, library visits, dance classes, bowling, café lunches and even going to watch their favourite AFL team at a training session. If you have a standard South Australian Driver’s License and can make yourself available on a regular basis, regardless of the frequency, we would love to hear from you. Interacting with our staff, participants and other volunteers is truly an uplifting experience!